US President Barack Obama has secured enough support in the US Senate to ensure that the Iran nuclear deal will go into effect. 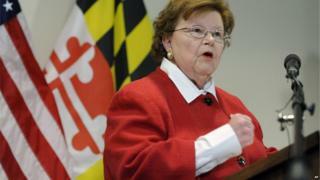 Democrat Barbara Mikulski of Maryland became the 34th senator to back the deal on Wednesday. US Congress could still oppose the deal, but Mr Obama has now enough votes to override any resolution of disapproval. He has said the deal cuts off "every pathway to a nuclear weapon" for Iran. "No deal is perfect, especially one negotiated with the Iranian regime," sad Ms Mikulski in a statement. "I have concluded that this Joint Comprehensive Plan of Action is the best option available to block Iran from having a nuclear bomb." Republicans have been unified in their opposition to the Iran accord, saying the deal would only "embolden" Iran. Media captionUS Secretary of State John Kerry: "The benefits of this agreement far outweigh any potential drawbacks"
Two Democratic senators - Chuck Schumer of New York and Robert Menendez of New Jersey -- are also opposed, as are a handful of Democrats in the House. Congress is set to vote on the accord later this month, but the White House is hopeful it can secure seven additional votes to allow for a legislative move known as a filibuster. A filibuster would prevent a final vote and Mr Obama would not need to use his veto power to keep the Iran deal on track. President Obama has secured only the minimum number of votes needed to ensure that Congress can't ultimately block the Iran deal. So the administration will be trying to broaden that support amongst Congressional Democrats to strengthen the domestic credibility of the agreement, especially as Republican lawmakers and pro-Israel groups will continue to rally opposition. The presidential election campaign will also provide a continuous platform for Republican candidates who oppose the deal. But either way it will be implemented - probably beginning sometime next month - creating a momentum of its own. And there's no doubt this is a major foreign policy achievement for Mr Obama. He's managed to negotiate a diplomatic agreement with America's avowed enemy. Internationally, it means that Iran will be brought in from the cold, which will change the dynamics of the Middle East - for good or ill.
Prime Minister of Israel Benjamin Netanyahu has repeatedly spoken out against the deal, calling it a "bad mistake" and that it provides a "sure path to nuclear weapons". Activists on both sides have spent millions of dollars on advertising campaigns and pro-Israeli lobbying groups have put pressure on lawmakers to not support the deal. The deal, reached in July, would begin to be implemented by November.